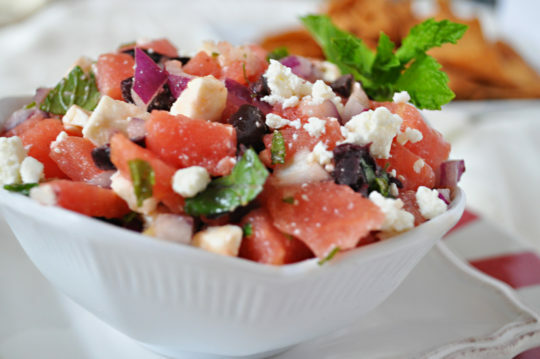 An unusual combination, yet, one of my summer favorites with sweet watermelon, fresh mint, salty olives, and feta bursting with sweet and salty in each mouthful. This recipe is from Holly Clegg’s trim&TERRIFIC® Too Hot in the Kitchen: Secrets to Sizzle at Any Age. In small bowl mix together all ingredients. Serve. Spicy Advice: Try the red pepper seasoned rice vinegar for a little extra zing. Raid a salad bar for fresh Kalamata olives-it makes a difference.